I Didn’t Ask About the Serial Killer (But I Wanted To) – Jenny and Jonathan Got Married! When Jonathan and I visited Chicago in June, I took a boat tour through the Chicago Architecture Foundation (CAF). 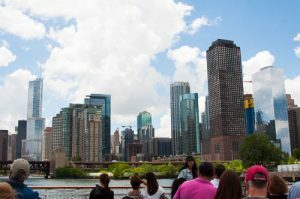 Several groups provide architecture boat tours in Chicago. I found no large difference in the ticket prices. I googled the reviews for 3 of these operators, and they all had high marks. To be honest, I almost didn’t choose the CAF tour because one of these reviewers noted that his CAF tour guide provided extensive architectural detail. This intimidated me. However, in the end I chose the CAF tour because its ticket booth and docks were the closest to our hotel. To be honest again, my knowledge of architecture is limited to what I learned during the Victorian Christmas tours in Pittsburgh (in Allegheny West). So I don’t know much. And downtown Chicago architecture is much newer because almost all of it was built after the Great Chicago Fire of 1871. I learned on the tour that many of the featured buildings were on the sites of other buildings that had been torn down specifically be rebuilt, sometimes many times over. My CAF tour guide was a volunteer, as they all are. His enthusiasm for architecture did not bore me or, more importantly, make me feel stupid. And I managed to not ask about Chicago’s serial killer H.H. Holmes. Even though I wanted to do so.